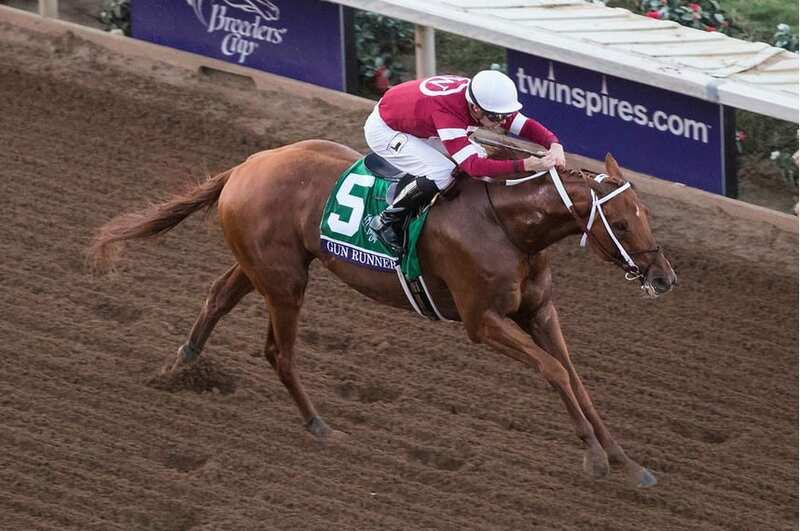 Gun Runner dazzled in winning the 2017 Breeders’ Cup Classic and is top-rated in the new NTRA Top Thoroughbred Poll. Photo by Ting Shen/Eclipse Sportswire/Breeders Cup. As the “Road to the Kentucky Derby” gets underway, voting in week one of the National Thoroughbred Racing Association (NTRA) Top 3-Year-Old Poll mostly is based on two-year-old performances of 2017, as the newly minted sophomores begin their 2018 campaign. Newly crowned Eclipse Champion for Two-Year-Old Colt Good Magic takes first place with (24 first-place votes and 355 votes). Trained by Eclipse award winning trainer Chad Brown for Stonestreet Stables LLC the 2017 Sentient Breeders’ Cup Juvenile winner is currently at Palm Meadows training center in south Florida preparing for his 2018 campaign. Good Magic leads the Kentucky Derby Leaderboard with 24 points. The 20 horses with the most points will earn a spot in the starting gate on the first Saturday in May. In second is Bolt d’ Oro (11 first-place votes; 329 points) who currently has 14 points on the Kentucky Leaderboard. The Medaglia d’ Oro colt is expected to take the Southern California route to the Derby for owner and trainer Mick Ruis with a return to the races in March. Sham Stakes (G3) winner, McKinzie moves into third position (2 first-place votes; 244 points). Rounding out the field is: Solomini (198); Instilled Regard (189); Catholic Boy (1 first-place vote; 154 points); Mask (113); Firenze Fire (107); Enticed (85) and Mourinho (73). 2017 Horse of the Year and Champion Older Male Gun Runner is number one in the NTRA Top Thoroughbred Poll for horses four and up (36 first-place votes; 360 points). Trained by Hall of Famer Steve Asmussen for Winchell Thoroughbreds LLC and Three Chimneys Farm, the Candy Ride offspring finished out his racing career by taking the second running of the $16 million Pegasus World Cup Invitational (G1) this past Saturday at Gulfstream Park. Gun Runner retired to stud duty standing at Three Chimneys Farm. Taking second berth is West Coast (2 first-place votes; 341 points) who finished second to Gun Runner in the Pegasus for trainer Bob Baffert and owners Mary and Gary West. Champion Turf Eclipse Award winner World Approval (219) is ranked third, followed by Champion Older Female Forever Unbridled, who moves into fourth on the ladder with (162). Rounding out the top-ten are: Gunnevera (151); Abel Tasman (130); Roy H (98); Sharp Azteca (94); Beach Patrol (78) and Unique Bella (75).